Here are photos from the event on 16 May 2012 at CCMC – a live webcast with Hillary Clinton and civil society around the world! 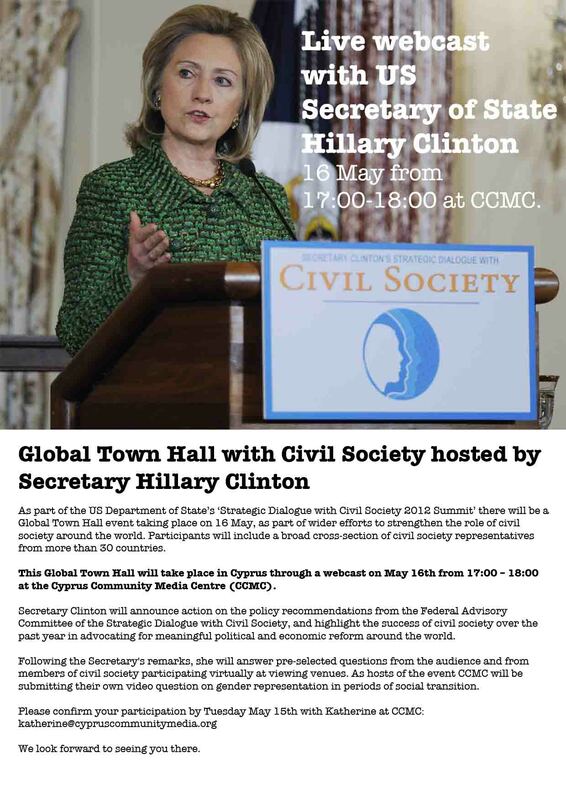 Live webcast: ‘Global Town Hall with Civil Society’ at CCMC hosted by Secretary Hillary Clinton on 16 May, 5pm, at CCMC. As part of the US Department of State’s ‘Strategic Dialogue with Civil Society 2012 Summit’ there will be a Global Town Hall event taking place on 16 May, as part of wider efforts to strengthen the role of civil society around the world. Participants will include a broad cross-section of civil society representatives from more than 30 countries. This Global Town Hall will take place in Cyprus through a webcast on May 16th from 17:00 – 18:00 at the Cyprus Community Media Centre (CCMC) in Nicosia’s buffer zone. Secretary Clinton will announce action on the policy recommendations from the Federal Advisory Committee of the Strategic Dialogue with Civil Society, and highlight the success of civil society over the past year in advocating for meaningful political and economic reform around the world. Following the Secretary’s remarks, she will answer pre-selected questions from the audience and from members of civil society participating virtually at viewing venues. As hosts of the event CCMC will be submitting their own video question on gender representation in periods of social transition. We’re looking forward!